Navajo language embodies a specific set of spatial concepts. Hindu culture places a high value on all forms of life. Major league baseball permits base stealing. MLB places a salary cap on every team. The nineteenth century British state incorporated a strong prime minister. Urban Latina women have a higher rate of X disease than the general population. Winston Churchill advocated for the assault on the Dardanelles in 1915 in order to help resupply the Russian Army. Democracies do not wage war against democracies. South Indian villages embody a very high degree of social and gender inequality. Racial health disparities are caused by numerous factors, among which is the fact of the personal stress of living in a racially hostile environment. Public goods are generally under-provided in market societies. Socialist enterprises are generally inefficient because of a soft budget constraint. Official corruption is more frequent in legal-institutional settings with properties X, Y, Z. Properties U, V, W cause lower levels of official corruption in systems that embody them. Working class identity in the United States is fractured. Deferred stock options are offered because they help solve principal-agent problems in high-tech firms. Major cities have mass transit systems to facilitate integrated labor markets. Fishing resources are generally over-utilized because of freerider behavior. Assertions of fact — x has property P, y has relation R to z. Assertions of regularities and probabilistic properties of individuals within a population — x’s are usually P, the probability of E in circumstances C is p.
Assertions of unobservable processes and mechanisms. Singular assertions of causation — x caused y in circumstances C.
General assertions of causation — X’s generally cause Y’s in circumstances like C.
Interpretive assertions — the meaning of P’s behavior is X.
Intensional assertions — P performed X in order to bring about Y.
Ontological assertions — X’s consist of Y’s. Compositional assertions — X is part of Y.
Functional assertions — the function of X is F (within system S). This list can be further broken down into a small number of ontological categories: logical individuals, properties and relations, probability as frequency, causal relation, social identity, meaning and intention, social compound, function, system, structure. We might also need to specify the metaphysical concepts of change, time, space, continuity, uniformity, heterogeneity, and network. And we might want to specify a few epistemic concepts — observable, hypothetical, testable, refutable, warranted. Are there any assertions in the social sciences that do not fit into one or another of these logical forms — statements of fact, generalizations and estimates of conditional probabilities, causal hypotheses, theoretical statements, interpretations of meanings of actions and symbols? It is difficult to come up with examples of assertions that cannot be reframed in these terms; certainly all the examples provided above can be paraphrased in terms of the logic of these varieties of assertion. So we might provisionally consider this list of types of assertions as being reasonably comprehensive. Does this analysis permit us to make use of a standard logical system of representation in terms of which to formulate all social science claims? This question is analogous to the task faced by symbolic logic at the time of Frege (The Foundations of Arithmetic: A Logico-Mathematical Enquiry into the Concept of Number ): is it possible to create a minimal symbolic syntax that permits the formulation of all truth claims within mathematics. The first-order predicate calculus is the primary effort that logicians have offered as a solution to this problem. 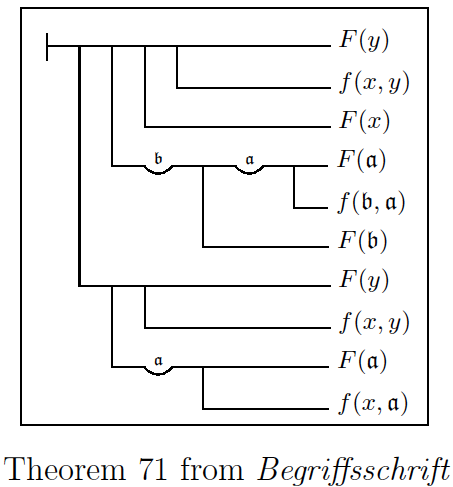 And it is worth noticing that there are certain ideas that cannot be expressed within the resources of first-order logic — the idea of necessity, for example. Modal logic introduces a new primitive operator representing the assertion that a sentence is necessarily true. Likewise, counterfactual conditionals cannot be expressed within the resources of the first-order predicate calculus. (Possible world semantics is an effort to address this lacuna.) So we might consider, for the social sciences, what needs to be added to the resources of first-order logic to permit us to express all these kinds of assertions. For example, do we need a special causal operator xCy, or is “x causes y” simply another kind of empirical relationship between x and y, analogous to “x is longer than y”? Do we need an additional apparatus for representing conditional probability statements — P(E|C) = r? Do we need one or more propositional operators to represent intensional states: x believes that P, x intends that R, etc.? Formulating the concepts we use for analyzing social phenomena also raises major intellectual issues — and we have to confront these conceptual problems in order to be able to formulate simple factual assertions. What do we mean by corruption? What is a democracy? Further, it seems likely that many assertions can only be understood within a framework of other theoretical concepts and ideas, developed within the monograph or within the larger research community and literature. “What is a ‘Hindu community’?” is a question that will be explicated differently in different research traditions — ethnographic, linguistic, religious studies, comparative politics, women’s studies. We can also ask what sort of logical order exists among concepts in the language of the social sciences — is there a minimal set of concepts capable of expressing all possible ideas about the social world? Essentially, this amounts to the question of whether it is possible to define all possible social concepts in terms of a set of primitive concepts and logical compounds of primitive concepts. For example, suppose we are interested in analyzing the concept of a “social identity”. We have the choice of regarding “social identity” as a new primitive concept; or we can attempt to define this concept in terms of other concepts — perhaps the individual-level concepts associated with individual belief and representation. Second, how do we define the property P? Are there reasonably clear criteria of application to individuals, so it is credible to assert there is a fact of the matter as to whether y had P or not? Is P applicable on the basis of observable characteristics? Does P implicate additional hypotheses about causation or unobservable characteristics? The concepts of a confessional religion, a market economy, narcissism, or a liberal democratic state all involve complex efforts at theory formation, involving the identification of a set of more basic characteristics and the formulation of a small theory about how these characteristics hang together in concrete historical instances. Finally, we can ask the ultimate question: what is the body of evidence and inference that allows us to conclude that x has property P? What are the vulnerabilities of this chain of inference? How credible is the attribution?